This is the argument that I talk about not having kids and being happy with that decision but really do want them and am pretending or faking myself out to believe I don't. That's more likely a projection of the other person than it has anything to do with me. As someone who is constantly processing and putting time and thought into his actions, I have been more than comfortable with my decision; it's not something I've faltered in. It's something I'm assured of and feel it's only right that I boast of my choice just as those who choose to have children also do so. This argument usually argues that I'm trying to make parents feel guilty about their choices or to somehow devalue people who decide to have children. Again, this is more projection from the person than it is accusation from me. I understand why people want to be parents; I understand the beauty and wonder of raising children (See side note below). However, my choice not to do so is often an affront to their choices (conscious or not) to have children. Thus by saying, I'm happy in my choice to not have children, they hear it akin to me saying they could have been happy without kids (or future possibility of kids). So then why do I talk about it so much? 1. It's a significant part of my life. Just as having children is a big part of parents' lives, not having children is equally a significant part. It changes the course of one life and perception of time. Instead of my 30s being a time of nesting, raising pups, and running around like crazy taking care of children, I'm exploring different physical, intellectual, and spiritual experiences while contributing to the world around me in myriad ways. Much of my successes and opportunities stem from the choice not to reproduce. 2. To open up the idea to others. There is no real discussion or space in our culture for those that choose not to procreate. Our culture like many others celebrates the act of reproduction through stories, rituals, and traditions. And yes, a culture should celebrate its youth and encourage reproduction for the stability of the culture. However, we do so largely in this culture at the disregard of those that don't have children. There's no real place for them in society and very little encouraging in our culture for people to consider to not have children. Just like how we communicate gender norms throughout childhood, we largely inform our youth that their purpose is to procreate and don't have a healthy or reasonable dialogue about not having children. So I choose to talk about it regularly to give the opportunity and space for people to make a more conscious decision about it. Onto the book! 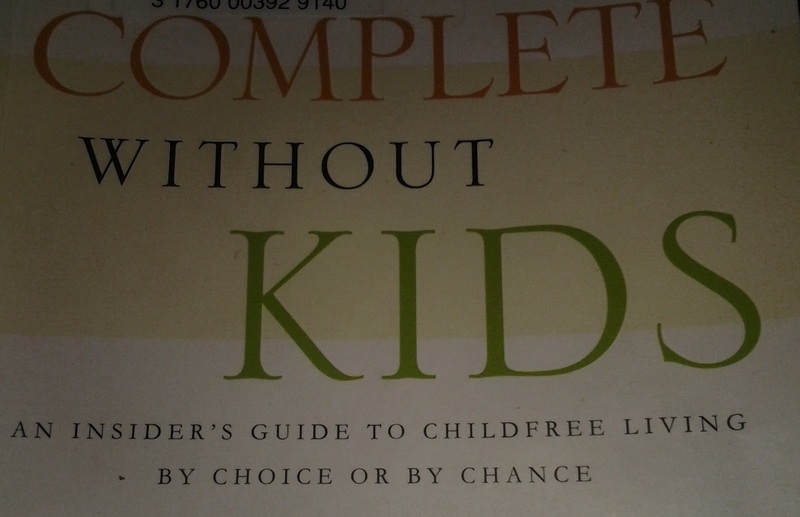 Walker approaches the subject first by re-framing it as "childfree" instead of "childless". Linguistically, this intrigued me from the start because it speaks of how we tend to frame adults. They are lacking--"childless". In a culture that orgiastically worships children and youth, to be "childless" means you lack any connection to what's important. Curiously, the word has overlap with the word "chilly"--clearly not a conspiracy of any sort, but interestingly nonetheless as that is somehow childfree adults are described as the author points out. The book operates as a guide for things to consider if a person is on the fence or a reinforcement of the decision for those that have decided. 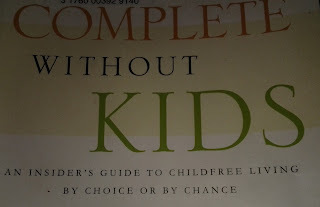 In fact, in many ways the author tries to play to several different audiences ("Childfree living by choice or by chance" as the subtitles reads) and I don't know that it works out as successfully if she had just charged in deep to one specific audience. She does provide a panorama view of the things to consider from coming to the decision, to engaging the world from this vantage point, to the new choices opened up to you by moving in this direction. She also emphasizes differences in relationship, wealth, and opportunities for those finding themselves along this path. My major critique of the book is that it doesn't really have a substantial strong male presence or approach about what it means to be a male without children. I don't think she fully considered that there are different experiences for men who don't have children than women. I would argue that there is. This is not a case of one has it worse than another, but how that decision is challenged or questioned often plays out differently. For women, not having children can often mean they are looked at as less, devalued, or not seen as a complete woman. For men, the judgment comes in other forms such as challenges about our masculinity and even implications or raise eyebrows as somehow being more predatory than men who do have children. So I think she misses the boat on that one (mayhaps the book I need to write?). All in all, she provides some good food for thought even for people who believe they are going to have children but want to think more critically about it before moving forward with the decision. I have to wonder if people had the opportunity to have a genuine conversation on the topic of whether to procreate or not, how many of them actually would--especially when we consider that about half of children born were unplanned. Some will read that line and say "You can't understand what it's like to be a parent because you aren't one." If you hold that line to be true, which seems to imply I'm devoid of feeling or sense making about something profound as life and love, and happen to be a parent or at least contemplating becoming a parent, then you cannot understand what it is like to be an adult who has consciously and permanently chosen not to reproduce. It's a silly argument that parents often put upon people who don't--or haven't yet--reproduce. By that logic, we can never understand addiction unless we're an addict, we can never understand any type of trauma without being exposed to it, and so on and so forth. It's simply silly.